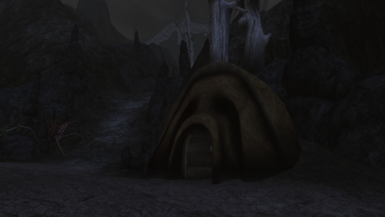 This mod adds three player homes for members of the Great Houses(one per House) in Balmora, Ald-ruhn, and Sadrith Mora. This mod only requires the base game, Bloodmoon and/or Tribunal are not required to use this mod. No other mods are required to play this one. This is a fairly simple mod that adds a few player homes to Balmora, Ald-ruhn, and Sadrith Mora. It exists because I wasn't satisfied with the house mods I've tried so far, and decided that I should just make my own. These houses can only be purchased by members of their respective Great Houses(so Hlaalu in Balmora, etc.). Rank doesn't matter, if you have enough money, you can buy the faction house as soon as you join the faction. Each house costs 2,000 drakes. None of them are particularly over-powered, so you won't find extremely value ingredients or things like that in them by default, but they do have over-powered containers(containers added by this mod hold ten times their vanilla versions' normal capacity). Each house has about 14,000 units of storage capacity between its containers. The house in Balmora is on the east side of the canal, northwest of Caius Cosades's house and next to the watchtower. It's just Vorar Helas's house, but with new containers. All of the ownership tags have also, of course, been removed, along with the owner of the house this one is a copy of. You can purchase this house from Tavia in the Balmora Council Manor. The house in Ald-ruhn is just east of the Temple, north of a small group of other houses near the path into the mountains. It's Ilmiril's house, but with the same changes as were made to the Balmora house, and a slight tweak of the layout. You can purchase this house from Demith in the Redoran Council Hall. 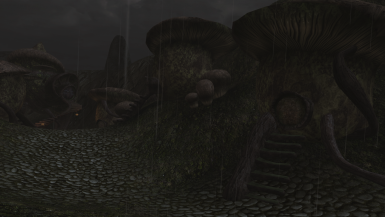 The house in Sadrith Mora is east of Tel Naga on the ridge, where the mushroom houses become sparse in number. It's Thervul Serethi's house, but with the same changes as the others. 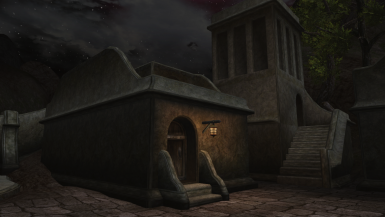 You can purchase this house from Lysanna in the Telvanni Council House. Thanks so much for trying my first mod! I'm sure I'll look back on it with mixed feelings, but I hope it's enjoyable despite being very simple.